Suctions to any non-porous surface. Contoured handle. Push levers down to attach to surface, flip up to remove. Use in horizontal or vertical position. 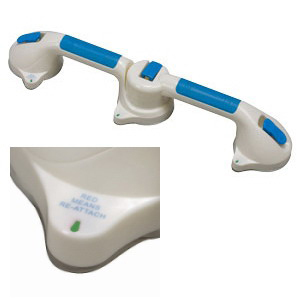 Dual grip grab bar rotates 180 degrees. Grab Bars suction to any non-porous surfaces to prevent slips and falls. Push levers down to attach to the surface or flip up to release. Indicators change from red to green when secure. Easily rotate in any position to accommodate your needs with 180° swivel.